Flying without live TV, WiFi, leather seats, power outlets and food on demand is just plane un-American. American Airlines will surprise and delight customers flying between Dallas/Fort Worth and Los Angeles or San Francisco this winter with a new promotion and prize giveaway launched today. 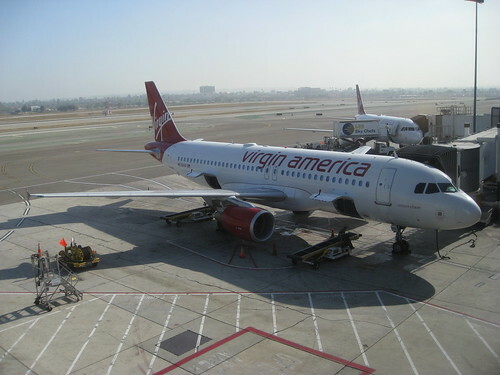 Between Nov. 29, 2010 and Feb. 28, 2011, American will reward AAdvantage members who fly round trip on nonstop service between DFW and LAX or between DFW and SFO with double elite qualifying miles and double flight miles. With this great offer, members can reach AAdvantage elite status faster and add to their mileage balance at the same time. To qualify, register prior to travel and obtain complete details at http://www.aa.com/15days using promotion code LASF2. A friend of mine, a big Anchor Steam fan, is having a birthday in January. He’s suggested that a group of us all travel to San Francisco to gather together to visit the Anchor Brewery, and to celebrate his birthday at the Bourbon & Branch speakeasy. I’ve heard so many good things about Virgin America that I’ve considered flying with them on this San Francisco trip just to see if they live up to their reputation. But now that American is offering double AAdvantage Miles and, more importantly, Double Elite miles, there’s no way I’ll give that up just to try Virgin. Yes, I am ashamed that I’m such a sucker for miles, but it’s not like Virgin offers enough flights from Dallas to enough cities that I’m going to switch and give up AAdvantage miles anyway. I welcome Virgin and the competition they bring to Dallas. American has a vitrtual monopoly on the DFW market and it irks me that we pay so much more for fares than travelers in Chicago, Los Angeles, New York, Houston, Atlanta, even Detroit. Anyway, you have to register in advance of travel using promotion code LASF2. Go here for details, terms and conditions.